Quite frankly not an untrue statement! A simple landing page that isn’t too dissimilar to its Cherry Casino older sibling, it’s easy to navigate and familiar to anyone who’s played at Cherry. Therefore, a nice transition for anyone who’s familiar, but also fresh and interesting for those who haven’t yet had the pleasure. Clicking the tabs on the left-hand side gets you straight into game play. Whether its casino, live casino or fancying your luck on the lotto. All clear and there for you to get right in. Frank & Fred love their players and want everyone to experience their new casino. This is why they have such a tantalizing Welcome Bonus. These lovely people give new players a spin on the NetEnt wheel, where you can win anything from 10 to 100 free spins to get you started. This then triggers the bonus package for the next three deposits. Make your first deposit and you get 100% deposit bonus AND 100 spins on Starburst, which are split over the course of 10 days. The second deposit bonus is a 50% bonus up to €100. Finally, the third bonus is a 50% bonus up to €100. The welcome bonus T&Cs are pretty standard. Not all games count equally towards the wagering bonus, so make sure to check the FAQs for the full list and contributions. Now who doesn’t love being a VIP. Let’s face it, we all love a bit of special treatment. Well here you basically get the red carpet! These guys have created a loyalty ladder that continuously rewards their players the higher they climb. And the higher you climb the better the perks and bonuses get. What makes this even more sweeter is the wagering. 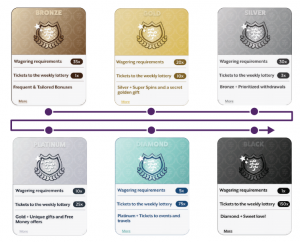 As you climb up the ladder, your wagering requirement lowers; starting at Bronze with 35x all way to Black with 1x. Yes! 1x! This casino is all about loyalty. The more loyalty you show, the more you get showered with goodies. For players who have been playing during a 7-day period get included in the Frank & Fred weekly raffle which offer some great prizes. Think that sounds good, well get on the VIP ladder. The higher you are on the VIP ladder the more lottery tickets you get. On top of that once a month the weekly raffle gets boosted with even more goodies! This includes luxury watches, getaways to distant paradises and even solid gold bricks! To make sure you’re not getting mugged off the raffles are all live streamed and saved so you can always go back and have a view if you want. There’s definitely no shorted of games with these guys. With 1000 titles you won’t be short of something to play, no matter what you fancy. Not sure what to play? Well they’ve got that covered for you. Head to the Casino tab on the left-hand side and click on “Casino”. This takes you to the wide array of games Frank & Fred have to offer. Pick from the most popular games, all the slots, jackpot games, video poker and table games. Definitely something in there for any game lover. If you want something particular you can use the search function at the bottom of the page. And if you’re looking for some inspiration, well don’t worry Frank & Fred have that covered too. When you search a few random games pop up too. Although their focus is on Slots, you can find a relative Live Casino section as well. A must when try to serve Highrollers. You’ll find an array of games including Lightning Roulette, Blackjack, and so on. Although it’s not as big as other Casinos we have reviewed, you can certainly satisfy your card playing, ball rolling and dice throwing needs. And with a tag line like that, who wouldn’t want to play the lotto! The lotto rules are really simple. If you loose… Get your money back! Overall this is a fun casino to play at. The welcome package is really enticing, with the VIP ladder and promotions help you keep wanting to come back and progress further. Clean, fun and easy to navigate. Plenty of reasons to play and to keep coming back! A solid 4.5 stars for this casino!